Received this image today at last after a voyage of quite a few weeks from the Ukraine. Can you hear the Balalaikas playing Maurice Jarre's Lara's theme from DR. ZHIVAGO? 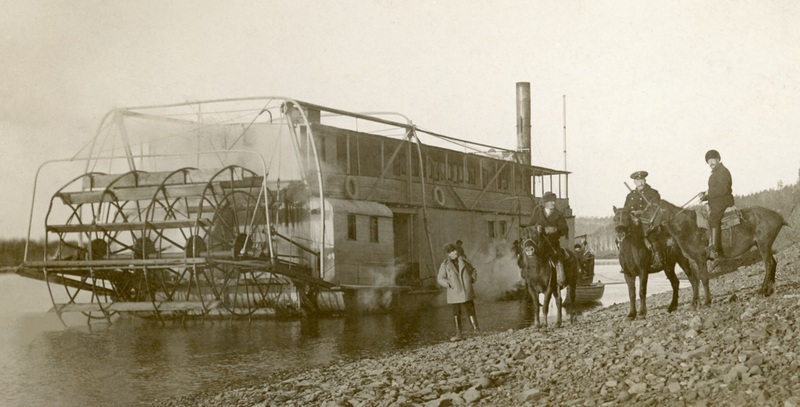 Pre Russian Revolution Cossacks on horseback pose on shore next to a sternwheel steamboat on one of the 3 rivers in Siberia which are the Ob, Yenisei and Lena that all flow into the Arctic Ocean. LISTED AS: "Siberia river steamer RPPC pre 1917"
Kiev or Kyiv (Ukrainian: Київ, Russian: Киев, Kijev [the capital and largest city of Ukraine, located in the north central part of the country on the Dnieper River. Attached is the best of 3 real photo postcards sent from Levasy, Missouri in September and December, 1910 from "Aunt Josie" to her niece, Mrs. R.O. Hutchins in Rifle, Colorado. 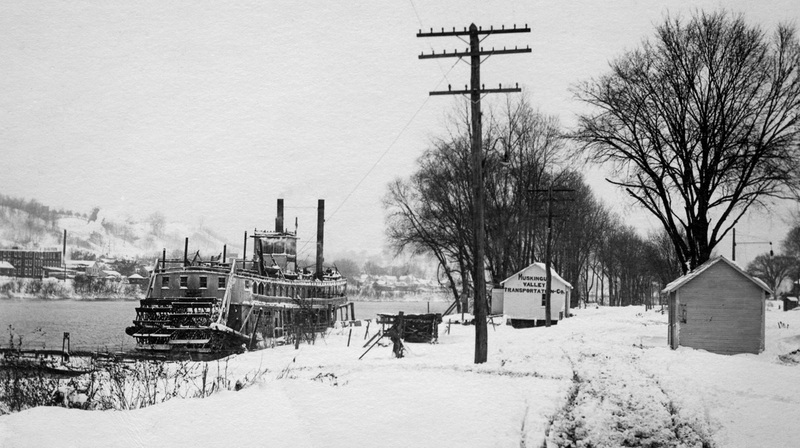 Levasy, Missouri is inland 4 miles west of the south shore of the Missouri River where Napoleon, Missouri is located, which suggests that this image of the J.R. WELLS and quarter boat could have possibly been taken in the vicinity of Napoleon. The first of the other two cards that accompanied the attached postcard were written and post marked Sept 17th, 1910 Levasy, Missouri from Aunt Josie to her Niece in Colorado: "This card is (of) the Rip Rap gang that Elmer worked with last Spring on the River. He has a large cross on his back in pencil you will see. He is bent over hoping to hear from you soon and to see you very soon after you get back." Written and post marked Levasy MO Dec 11, 1911 from Aunt Josie to her Niece in Colorado: "Ma has been sick but is better now. We had a terrible tragedy near here last week. A man shot and killed his wife and himself.Jack has caught 23 rabbits this winter and they are fine to eat this year. Jack is going up to your parents tonight." In 1898, the Anchor Milling Company, desiring to expand its business, began the construction of a boat at Tuscumbia to be 110 feet long and with a 20-foot beam. This boat became known as the J.R. WELLS, so named after one of the principal stockholders of the Anchor Milling Co. The WELLS did an extensive business on the Osage River, with Capt. John W. Adcock as pilot, later with Capt. P.F. Hauenstein. Local crews were employed on this boat, and during the boating season it was almost continuously engaged in hauling out wheat, barites, lumber, livestock, kaolin and other products as well as bringing up merchandise from Osage City and Hoecker. 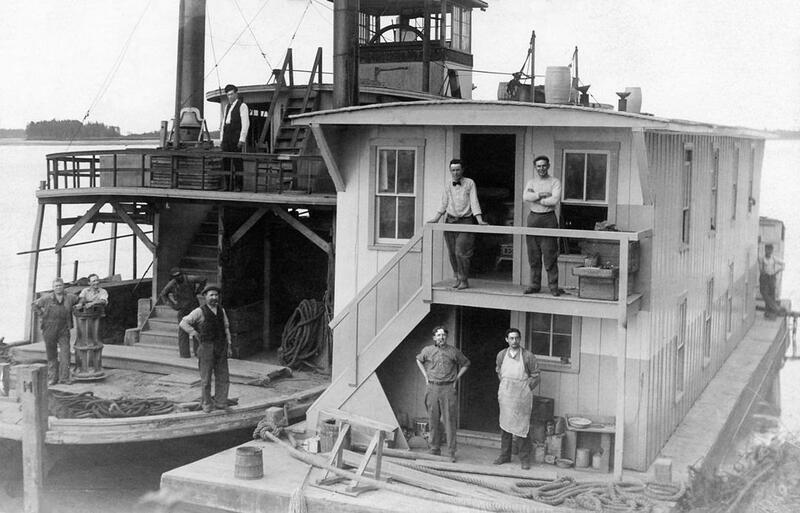 The Anchor Milling Company also built a large barge, the IDA, which was used to advantage in the Osage River service. The WELLS and its barge could handle approximately 6,000 bushels of wheat at a trip. 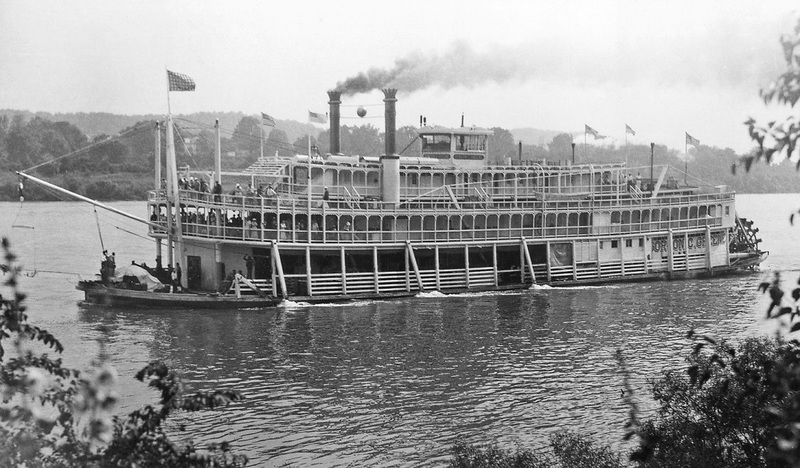 The DAUNTLESS was another steamboat which was built at Tuscumbia about the time the J.R. WELLS was launched. The DAUNTLESS was equipped with a tubular boiler, and was about 60 or 75 feet in length. It was built by a company of Tuscumbia businessmen for general freighting on the Osage. The RUTH, another boat built by J.R. Wells, was later operated in traffic by the Anchor Milling Company. The Osage River is a 276-mile-long tributary of the Missouri River in central Missouri in the United States. The Osage River is the 8th largest river in Missouri. The river drains a mostly rural area of 15,300 square miles. The watershed includes an area of east-central Kansas and a large portion of west-central and central Missouri where it drains northwest areas of the Ozark Plateau. The river flows generally easterly, then northeasterly for the final 80 miles where it joins the Missouri River. It is impounded in two major locations. Most of the river has been converted into a chain of two reservoirs, the Harry S. Truman Reservoir and the Lake of the Ozarks. Attached fully restored promotional postcard that dates circa the 1920's. Lettering and outlines around pictures are now freshened up. 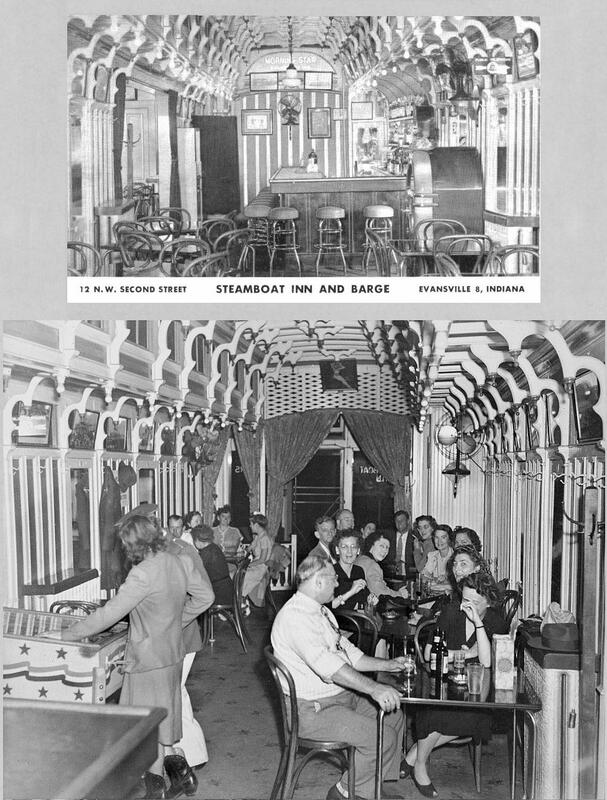 Upgraded the photos that were on the original card of the starboard view of the boat and the cabin with far better quality ones from the La Crosse collection. Built as the PILGRIM in 1917 at the Howard Ship Yards - Jeffersonville, Indiana. 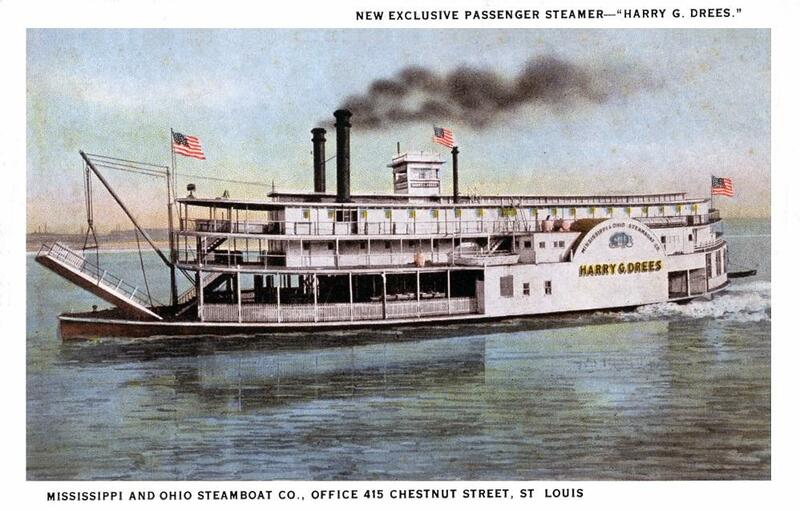 Remodeled into a tourist boat in 1924 by the Mississippi and Ohio Steamboat Company and renamed HARRY G. DREES after the new owner. Ben Winters was Captain during the mid-1920s. The DREES ran between St. Louis and St. Paul and often got stuck on sand bars due to her deep draft. She had 80 state rooms, shower baths, hot and cold water, toilets and electric lights. Was finally sold to Tampa, Florida where she gradually fell apart. Promotional grayscale postcard postmarked 28 Sept 1909 ST. LOUIS, MO to Mr. John Roberts in Emporia, Kansas with the message "We arrived safe. Sis." The Mississippi River waterfront at St. Louis is featured with the Eads bridge on the right and the steamboat CAPE GIRARDEAU visible at center. The Mississippi Valley Trust Company Building is a historic building at 401 Pine Street in Downtown St. Louis, Missouri. The two-story building was completed in 1896. It was designed by architectural firm Eames & Young in the Beaux-Arts architectural style. 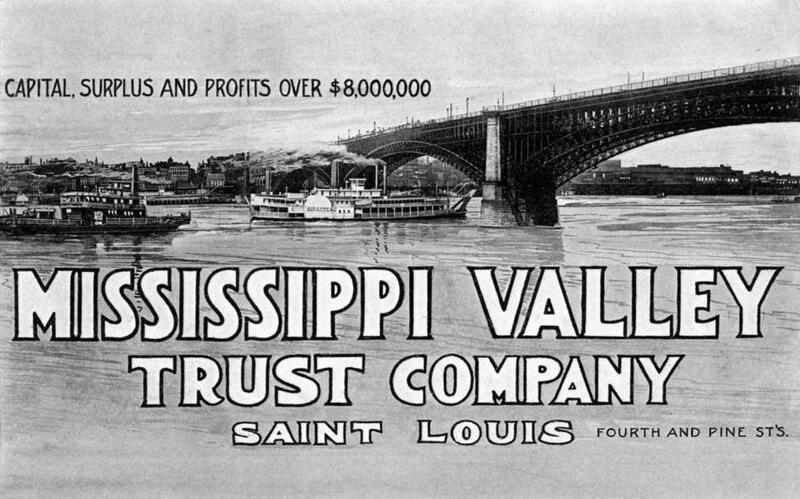 It was home to the Mississippi Valley Trust Company, a local bank which "financed transportation and communication networks in the St. Louis region, and was a supporter of the St. Louis World's Fair." The bank was later acquired by the Mercantile Bancorporation which was in turn acquired by the Firstar Corporation, and eventually U.S. Bancorp. Later, the building was home to a restaurant. Today it is used as office space. 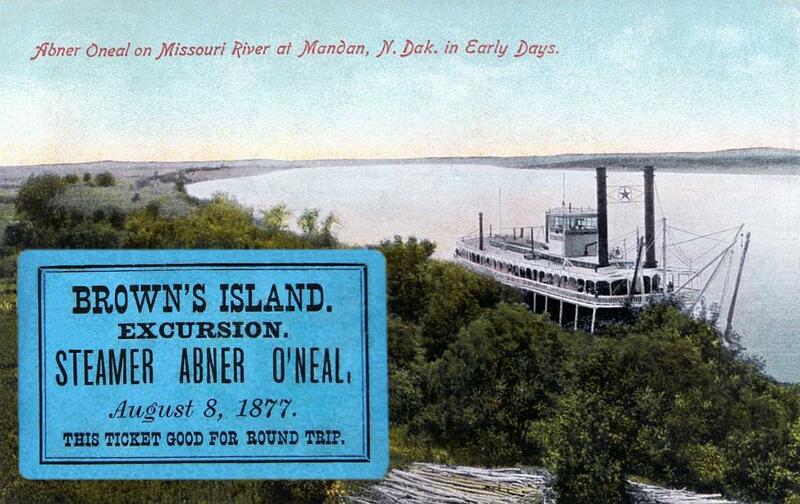 "Abner Oneal (sic) on Missouri River at Mandan, N. Dak. in Early Days"
Built in 1884 at Freedom, Pennsylvania; completed at Wheeling, West Virginia. Captain R.A. Talbott, W.L. Wilkins, clerk. 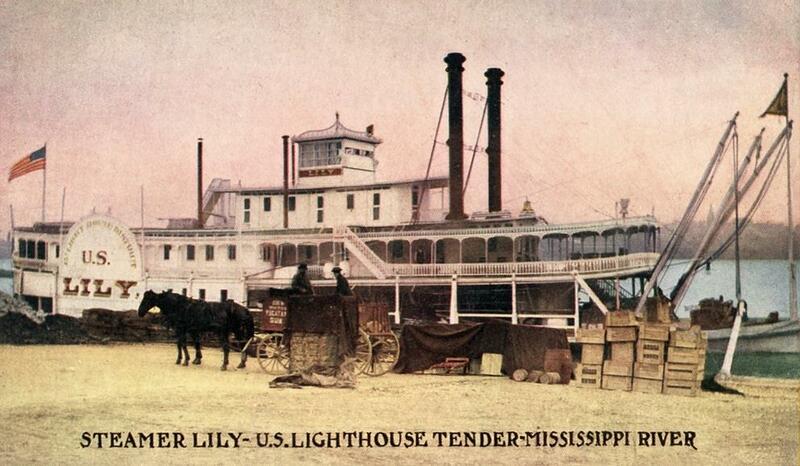 Lighthouse Tender LILY 1908 postmarked at Davenport, Iowa on the Mississippi. Lithographed color postcard postmarked 16 July, 1908 at Davenport, Iowa on the Mississippi. Frequently photographed, there are a number of good images of LILY in the La Crosse collection and John Stobart painted and atmospheric canvas of the LILY at night on the St. Louis waterfront with the Eads Bridge in the background. 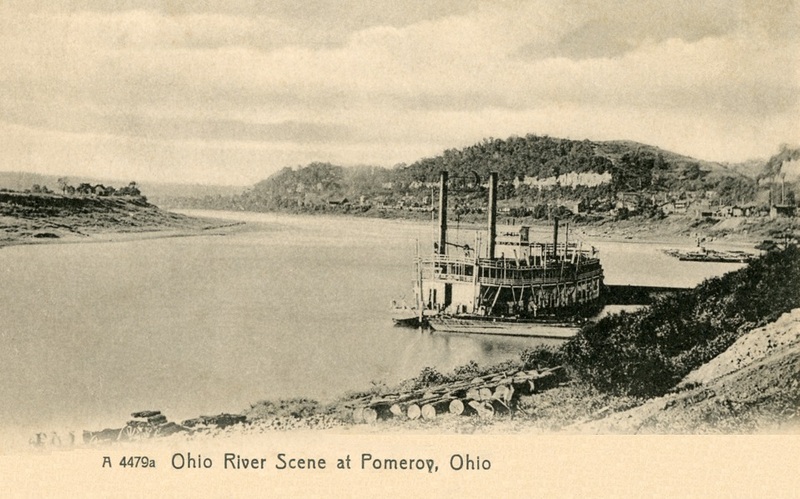 Began in service on the Ohio River. In 1888, she burned off her upper works and was completely rebuilt with a new hull and texas. The old hull became a wharfboat at Madison, Indiana. After being rebuilt, the LILY went to the upper Mississippi and Missouri rivers. She serviced beacon light buoys between St. Paul, Stillwater and the St. Croix River and St. Louis for many years. She was also the guard boat for the President's fleet. On October 17, 1911 she snagged near Wellington, Missouri. On November 24, 1911, she snagged again near St. Albans, Missouri, mile 49 on the Missouri River at the head of Centaur Chute and was lost . She was the first lighthouse tender on the upper Mississippi. Built at Sewickley, Pennsylvania, 1882. Ran Pittsburgh to Cincinnati 1908. She sank, while down bound, at Lem Lawrence's landing between Beverly and Luke's Chute on April 19, 1910. 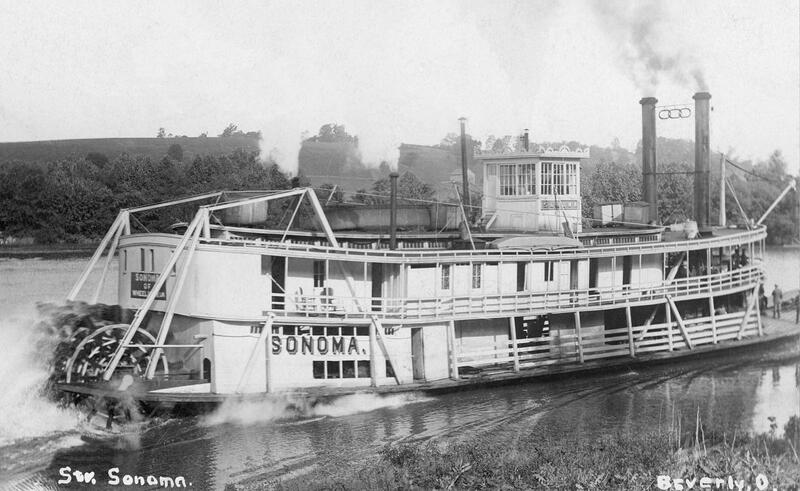 By 1913, the SONOMA was in the Madison-Frankfort trade when she turned over and sank on the 3rd of May that year after she hooked a snag while backing out of a Kentucky River landing one mile above Glen Mary in Henry County. Captain Webster quit the river after the sinking. The attached postcard of the Chester is one of the weirder ones with the bevy of young ladies, were the "Marquis girls" vaudevillians or "fancy wimmen"? . . . they're too old to be school girls. And why the Mexican straw hats? Captain looks like Will Rogers. I like the geezer with the huge beard that looks like a disguise. 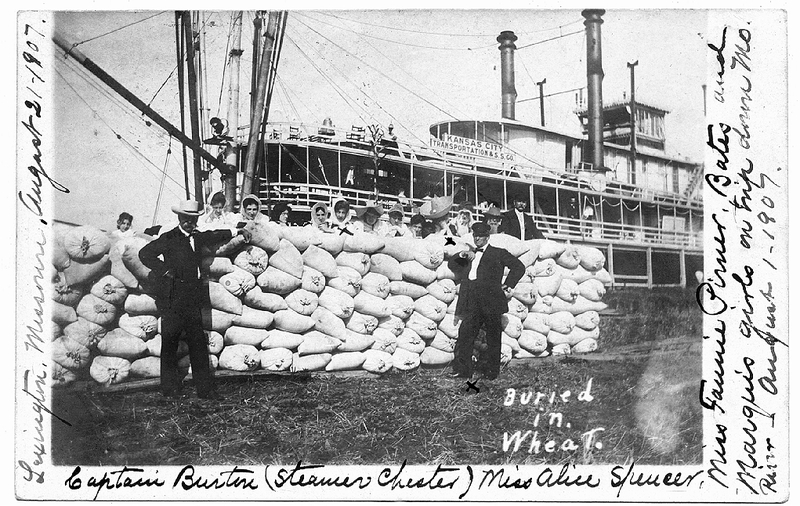 "Lexington, Missouri, August 21 -1907 Captain Burton (Steamer Chester) Miss Alice Spencer Miss Fannie Pirner (?) Bates and Marquis girls on trip down Mo. River - August 1- 1907." Below the postcard is a photo of folks enjoying beer and cocktails. A young couple areplaying a pin ball machine on the left. The girl is wearing cowboy boots and the youngman is wearing a uniform cap and coat along with a pair of white bell bottom trousers. This photo was taken from the bar area looking towards the street entrance with the tail endof the words STEAMBOAT INN visible on the window to the right. The interior of the Inn was made from parts salvaged from an actual steamboat cabin,probably from the MORNING STAR. Have heard that after the place closed that thearches and other architectural details were carefully removed and put into storage somewherein Evansville. Hopefully some day they will be resurrected and reassembled in a suitable place. The Gordon C. Greene, Cincinnati. This just in from a dealer in Germany, an unusual wintertime real photo postcard of the VALLEY GEM dated 10 November, 1913. On the right is a small frame building with signage painted on it: MUSKINGUM VALLEY TRANSPORTATION CO. Likely location was somewhere in the vicinity of Marietta, Ohio. Built for the McConnelsville-Zanesville trade on the Muskingum River in 1897 at Harmar, Ohio at Knox Yard From 1898-1917 she ran this trade, making one round trip a day. Owners in 1898: Captain Newton Price, C.F. Siler; J.H. Shipps, Charles F. Hearing, H.S. Shaner and Lee Humphrey. Captain Noll bought her in 1917 to use in the Pittsburgh-Fairmont trade on the Monongahela River. She was the last packet in the Fairmont trade. Destroyed by ice at Morgantown, West Virginia in February 1918. 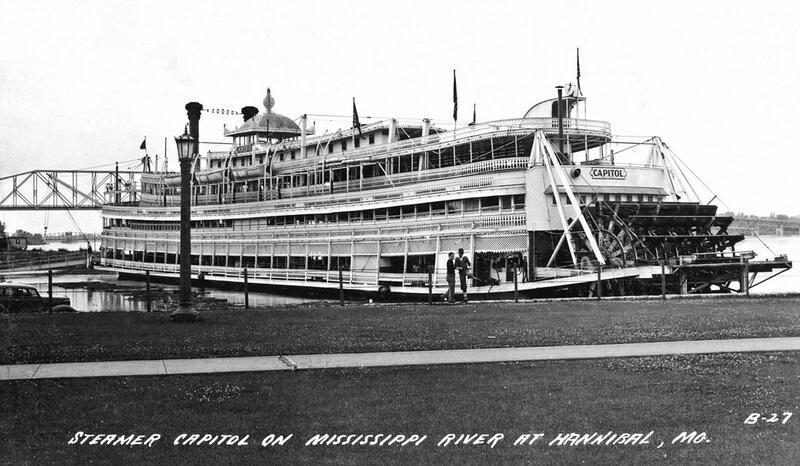 Real photo postcard post of the excursion steamer CAPITOL at Sam Clemens' hometown. We're way down here in Missouri where it's hotter than blitzen. I gather "blitzen" is used in one of the several German translations as "lightening." There are several ladies "Maria Lier" listed online including a Norwegian girl born in 1818. Bob's traveling companion may have made a "portmanteau" name by combining the two names which are still in use today.